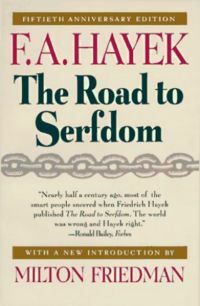 The Road to Serfdom is a book written by Nobel Prize winning economist Friedrich Hayek. Published in 1944, it argues that all forms of collectivism and central planning lead logically and inevitably to tyranny. The Road to Serfdom has since become one of the cornerstones of conservative and libertarian thinking. This page was last modified on 29 March 2018, at 10:32.